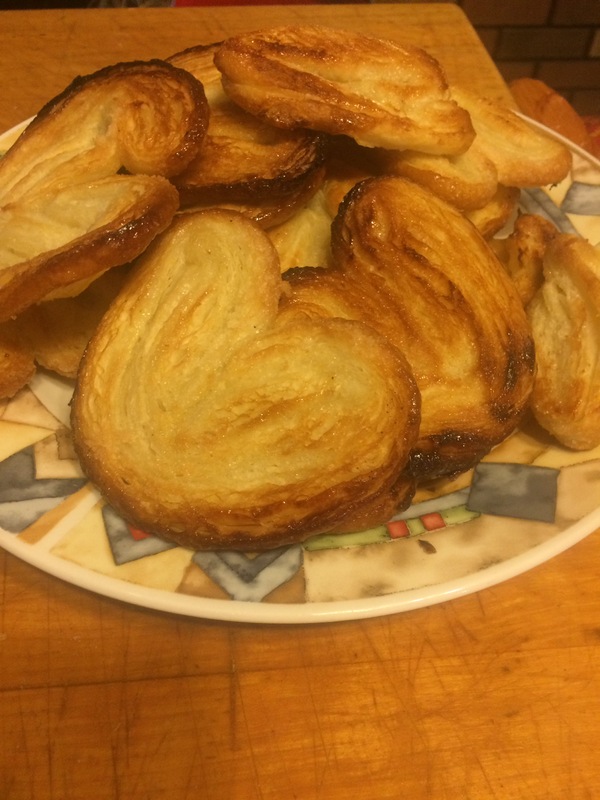 In French these are called palmiers, in English elephant ears, they are layers and layers of buttery, flaky dough rolled in sugar and baked at a high temperature, so that the sugar caramelizes and the layers of dough rise, light and airy. 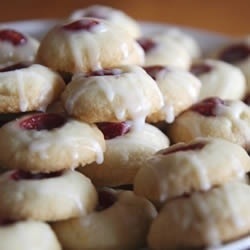 I think of all of the cookies I have baked over the years, these are hands down everyone’s favorite. 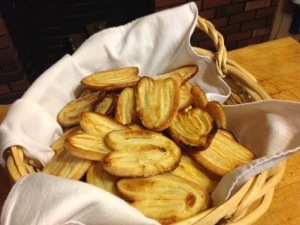 This year the palmier cookies are staying at home, the children are very happy about it, more for them! Today I am doing what I absolutely love doing, baking. I am making the puff pastry dough necessary to make the caramelized, delicate, buttery cookies that everyone in my family loves so much, the elephant ear cookies. I think that part of the reason why I love baking so much is how I myself end up smelling like dessert. I walk around the house while I wait for the pastry dough to rest in between the rolling and folding, smelling like butter and flour, a delicious, yummy smell. Actually butter combined with anything smells so very appetizing; butter and salt, butter and sugar, butter and garlic, basically butter anything smells and tastes wonderful. I know that according to all the health experts, too much butter consumption is not very good for your arteries, but I indulge my appreciation of butter mainly through my olfactory senses so I am fairly sure that my arteries are safe, you can’t clog an artery with your nose and sense of smell. My cookies will be done by the end of today and they will be shipped out shortly thereafter. That is all that I will say on the matter because their destination is a secret. I really do smell good, I’m surprised that jack isn’t laying on me licking me to death. It’s probably because he doesn’t associate me with his begging for treats, that is reserved for his papa, I am who gives him his regular food and I am his furniture, no licking included. Jack is really smart and knows who butters his bread; that’s me and I don’t like being licked. He was just sitting next to me looking at me with a curious look sort of “you smell different, I like it, I don’t know what it is but it’s nice” He is so cute. So pretty soon the house will still smell buttery, not in its raw form, but in its baked incarnation combined with sugar and caramelized by heat and that smells wonderful too. 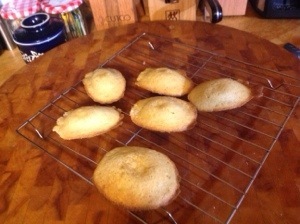 I have made Madeleines a few times over the years, always following Gale Gand’s recipe and they turned out alright; no one ever returned one saying they didn’t like it. This time however, I went to the Joy of Baking and I am much happier with the results. Their recipe called for making the batter the day before and refrigerating the batter overnight; both recipes called for buttering and flouring the Madeleine molds, but this step is to make sure that your Madeleines don’t stick, not change the taste or texture. 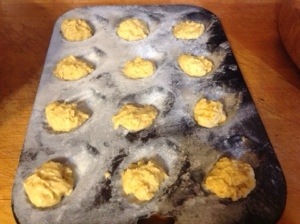 The ingredient list for Madeleines isn’t very long; 1 cup of sifted unbleached flour, 1/4 tsp salt, 1/2 tsp baking soda, 8 tbsp of melted butter, 3 eggs, 1/2 cup of sugar, 2 tbsp packed brown sugar, 1 tsp vanilla and lemon zest. The eggs, sugars, vanilla and lemon zest, I beat on med-high speed for at least 10 minutes until they were light, creamy and thick. 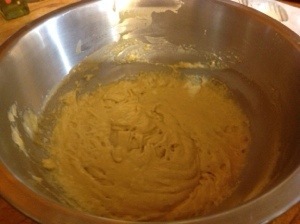 I folded the flour mixture lightly into the beaten eggs and sugar and then I put the melted butter into a small bowl, folded a bit of the batter into it, whisked the two together and then folded that back into the batter. Once everything was gently folded together and homogenous, I covered the bowl with aluminum foil and pop into the fridge. I found and both the baby boy and my hubby said it as well; these Madeleines seem lighter and spongier, maybe it was the resting in the chilled environment of the refrigerator that made the difference or the gentle folding at every step, either way I have found my new favorite recipe and technique for making Madeleines. They aren’t the prettiest, but they are quite tasty. I would say that making a pot of coffee and enjoying one or two Madeleines on a cold day makes the work involved baking these little cakes or cookies definitely worth it. 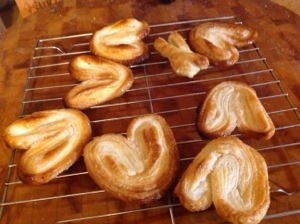 After the movie, I made Palmier cookies or more commonly know as Elephant Ear cookies. 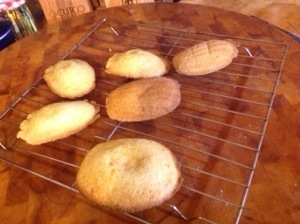 The cookies weren’t a big deal to make since I had the dough already made and frozen, it was simply a matter of thawing it out and rolling it in sugar, cutting it into slices and baking the cookies. The movie I, Frankenstein, what can I say, we went to see it despite the numerous awful reviews I read online. I was curious to see how we would rate the movie, given how extremely easy-going we are about our movie appreciation;especially when it comes to sci-fi/fantasy. I read that it was boring, stupid and poorly thought out. I wouldn’t have gone that far; but I can see why critics went negative with the reviews. The actors weren’t B actors either so it was surprising for the story to kind of disappoint as much as it did or was it the directing? I’m not sure because directing is as much telling the story as a script does, so I’m not quite certain which is at fault. I’m not blaming the actors; Billy Nighy and Aaron Earkert are wonderful actors as well as Yvonne Stronowski and I love watching them on the big screen. The only thing is that Aaron doesn’t make for much of a “monster”, even with the jagged scars, he is much too handsome to scare anyone. The beautiful doctor played by Yvonne had her moment of lust when she saw Aaron shirtless. She recovers herself and say afterwards that a monster is only deemed a monster through his actions. The Gargoyles are the heroes but even then, they lose their credibility when they presume to know God’s plan. There is a lot of presuming and assuming and the lesson here is that woe to he who does either. It’s that time of year again; time to bake some Christmas cookies for holiday cookie swaps, the baby boy and his friends and my hubby, the baby girl isn’t home yet, but rest assured when she gets back home, I will be baking again. 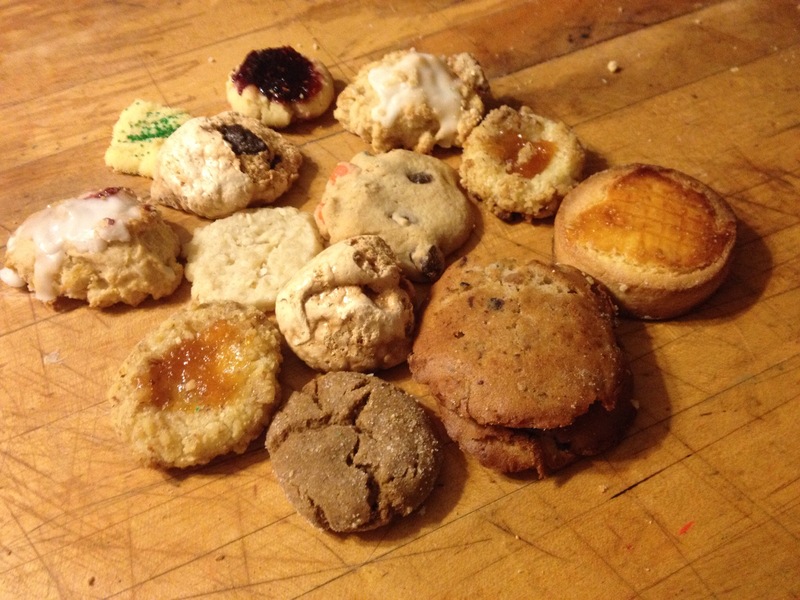 This year I decided to try a new cookie; the fruit preserve and almond shortbread cookie. The picture of the cookie is very pretty, a nice golden brown, tall shortbread cookie with a round circle of fruit preserve. Argh! Mine once again, no matter how many dozen I baked today, were flat, golden brown, though at least the fruit preserves stayed in the middle, at least I had that. Why did they fall flat? I don’t know, frustrating I tell you. 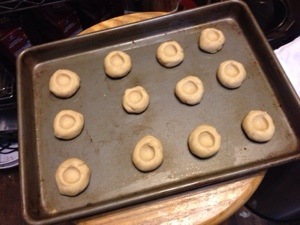 I followed the many tips and hints, I put the dough rolled out into balls with the indentations filled with fruit preserves in the refrigerator for fifteen minutes prior to putting them in the oven, I lowered the oven temperature and I made sure not to over-bake, but alas they still fell flat. However, boy are they good. They are so buttery, it is truly decadent, oh my goodness me. I love almonds in pastry, I love almonds in cookies, I love almonds everywhere and they are so lovely in the shortbread cookie. Here I’ll show how they turned out, they are almost embarrassing to bring to the cookie swap, but what can you do, I did make over 6 dozen and they are yummy for the tummy. Hopefully whoever picks them, will enjoy them so much that they’ll just eat them without noticing, I do have to mention that the ladies who take part in my friend’s cookie swap are extraordinarily talented and their cookies are always so pretty as well as really good. One of these days, perhaps, maybe, I’ll get the hang of making things as pretty as they are good, one of these days, eventually, hopefully. 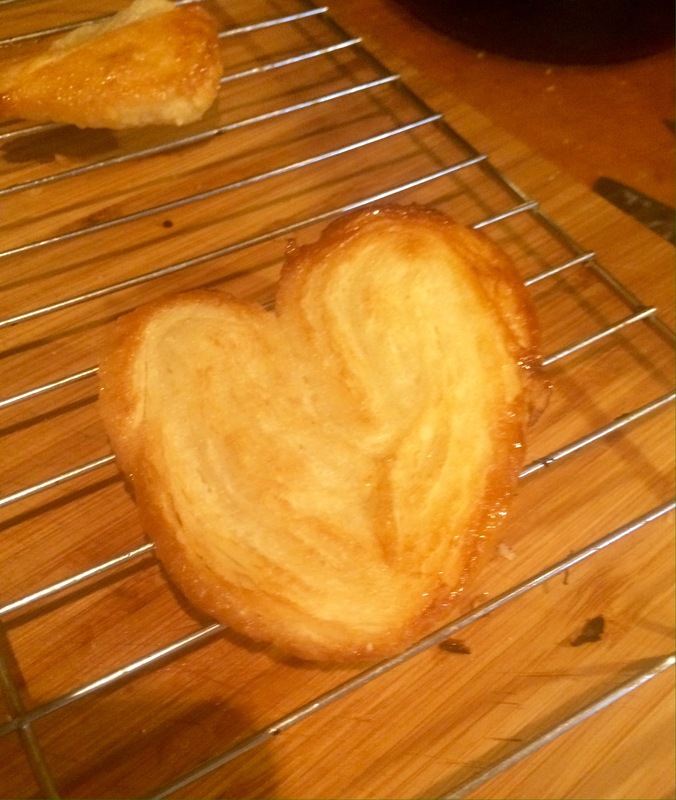 Tomorrow is the baby girl’s 19th birthday and she requested her favorite cookies, elephant ears in English or Palmiers in French. I have written about them before, how wonderful they are and how tricky they are to bake; only because of the cookie being dipped in sugar and the high temperature of the oven, 425 Fahrenheit, the chances of getting charcoal cookies are very good if you don’t keep your eye and nose on high alert. Anyhow as I make these more often, I still wonder how small bakery shops keep up with the demand because there is no getting away from the time constraints of the pastry dough itself. I made 2.5 pounds of pastry dough and from start to finish with the rolling, folding and resting times, it took all of five hours before getting all of the cookies cut and onto the cookie sheets. 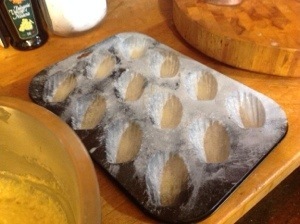 The baking took ten minutes per sheet so the baking took a little while. I know that even small bakeries have specific ovens but I still admire them for the way they produce their wonderful pastries. It is hard and if they run out of any of the intricate pastries, it isn’t as if they can just whip something up on a whim. 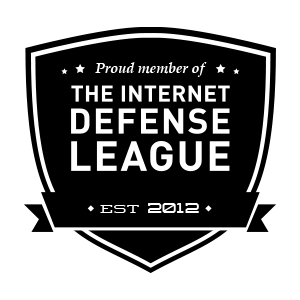 I also admire their product and time management. I used to have a tiny fantasy about having a pastry shop/ cafe but as I have written before, a day in the kitchen baking something just a little tricky is a healthy splash of water on my head to slap me back into reality. I love these cookies because everyone who eats them makes “the” noise, the surprise that reaches their eyes when they are taken in by the buttery layers and the caramelization on the surface of those same buttery layers. It does my baker’s heart and ego a lot of good when I hear and see those happy faces. The baby girl wants to torture us with her homemade chocolate chip cookies. 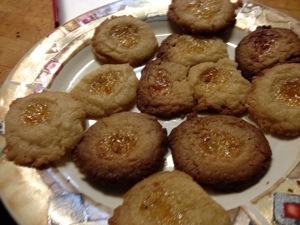 I have written about them before; in glowing reviews, her cookies are to die for. They aren’t too sweet, they are mouth-watering and moist, melt in your mouth delicious. She is making a huge batch tonight without a specific function to take them to, the cookies are going to stay here, where they are going to beckon to me, to my hubby, to torture us into eating them non-stop. Have you ever encountered a cookie where you couldn’t stop at one? My baby girl’s cookies are exactly those kinds of cookies. I just informed her that I was venting on my blog and she called me sassy pants. She then started saying that I shouldn’t be complaining when she made me cookies, I loved them and I should be happy to eat them. She doesn’t get the whole eating disorder thing; when you eat something sinful, you torture yourself for a day or two. I never want my baby girl to understand an eating disorder, I am happy that she doesn’t view food as the enemy. As I told her that I was writing about her cookies, there was a rascally smile on my face so she knew that I was complaining in jest. I’m proud of her baking skill and so is she. Pretty soon the kitchen is going to smell of butter, sugar and chocolate, woe is me. I can just see the tendrils of cookie essence snaking through the hallway into the living room calling me into the kitchen to taste a warm, right out of the oven cookie. Happy Monday! This evening at 5 o’clock, the Blandford Historical Society hosted the annual Christmas Tree lighting as it does each and every year, since it’s our own tree that gets lit and decorated by our directors and we invite the towns people to participate in the tree lighting ceremony complete with Christmas carol singing, cookies and hot chocolate. I have been a co-host of the event for the past two years, it is a fairly easy event to host; you bake cookies, you make hot chocolate and you set up the function room so that it looks merry and festive. This evening because of the beautiful mild weather we had a really good turnout, 36 people all together, for our Historical Society that is a nice number. We’re a very small town. Since part of my duties included baking cookies; I thought about what type of cookies I wanted to bake for the Society for a few days, I was vacillating between French Lace cookies, these are delicate cookies made with oats, pecans, orange zest, corn syrup and vanilla with chocolate drizzled on top or Palmiers, flaky puff pastry dough with is folded, rolled out and folded again and at the final stage rolled out in sugar, folded and rolled out again in sugar. They are called elephant ears in English because when you fold it in a double fold and then slice them into 1/4 inch slices, the shape that they take after baking, to the French eye looks like a Palm leaf and to the American eye, they look like elephant ears. Mine aren’t as big as the ones you find in the bakeries here, mine are only about 2 inches in length and an 1 1/2 wide. I have to admit that the choice of cookie wasn’t that hard to make. 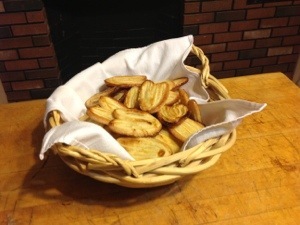 Last year I had made the French Lace cookies and they were a hit but not in the same way that the Palmiers cookies were when I had made them for the opera last August. These cookies are light, buttery and not too sweet. They aren’t that hard to make, all it requires is patience because you need to roll the dough out to a 17″ by 7″ size, fold it into tri-part envelope, with the seam on your left, then you roll it out once more to a 17″ by 7″ size and then you take each end and fold them towards each other so that the ends meet in the middle and then you fold it like a book and you refrigerate it once more for another hour. 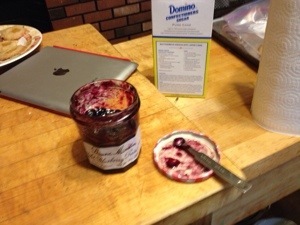 You repeat this process once more and then you’re ready to start the sugar part of the process. All this rolling and folding is precisely what makes the cookie so light and buttery flaky. 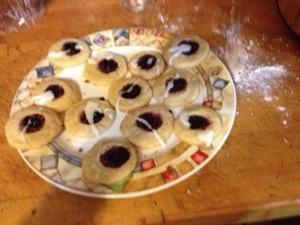 My society friends and many of the guests all complimented me on the cookies. The kind words and obvious appreciation make all the work very much worthwhile. When I finally get a camera, I’ll be taking pictures once again of my adventures in cooking and baking. My cookies definitely had a homemade look to them, there wasn’t a uniform look to any of them, I guess that is part of the homemade charm. I tried to get them to caramelize to an even golden color but I still haven’t figured out how to do that. One of these days, I’ll get them to a place where they are prettier, but for now I am happy that they taste good.